I am superlatively happy with my Samara Cardigan at this moment. I realized today that the pocket (I only added one) holds an A5 notebook perfectly, and I am a great lover of A5 notebooks. Currently using a white Midori, which also just looks nice peeking out the top of my pocket, and I am so happy. I am going to get a chain for my brass pen, and together, they will form the perfect work outfit. But this cardigan (cardigan feels like the wrong word...) is also weekend casual comfortable. And art-party cool (the first place I wore it was to Lugo, the Saskatoon art gallery's annual fundraiser-party. Felt right.). It makes the day-to-night transition seamlessly (so to speak). It is a perfect piece of clothing. And! I'd already made my son a grow with me romper in the fabric, so a total mom-son hang out look to last. <3. I'm excited. As for the sewing. This was super-simple for construction, and the Victory Patterns instructions are as ever thorough, particular, and clear. I totally skipped over the instructions for the patch pocket, thinking, oh, I'll do in seam pockets! Then forgetting about that, because I basically always sew tired. As I already mentioned, I've ended up perfectly in love with the size of this patch pocket, so now I can't see going back to in seam pockets for any reason. A5 for life! The forgetting meant I also forgot to put in the belt loops, but I haven't finished the sash and am not sure I'll even want to wear it with the sash much, so I'm not too fussed. I really love how the jacket falls without a tie, it feels artful and architectural. Besides, I can't just easily unpick the side seams to add belt loops, as I did french seams along the sides, mostly because I love the look of french seams. Always satisfying. What in the world is the history of the terms "french seams" and "coutures anglaises?" I love that those are their names and I want to know whyyyy! I also tried to do a stretchy version of a Hong Kong finish on the lapel seam. I figured I could do it like a binding on baby clothes, using an inch and a half wide strip of lightweight bamboo jersey leftover from my Kielo wrap dress to cover up the ugly end bits. I should have used my walking foot for this, but took it off because it was so noisy and I just wasn't feeling it... Thus, it is a bit over-wavy, but some good steaming has already helped. It looks rather nice, and makes me not wish for a serger at all. Just the way I'd like to continue to feel. 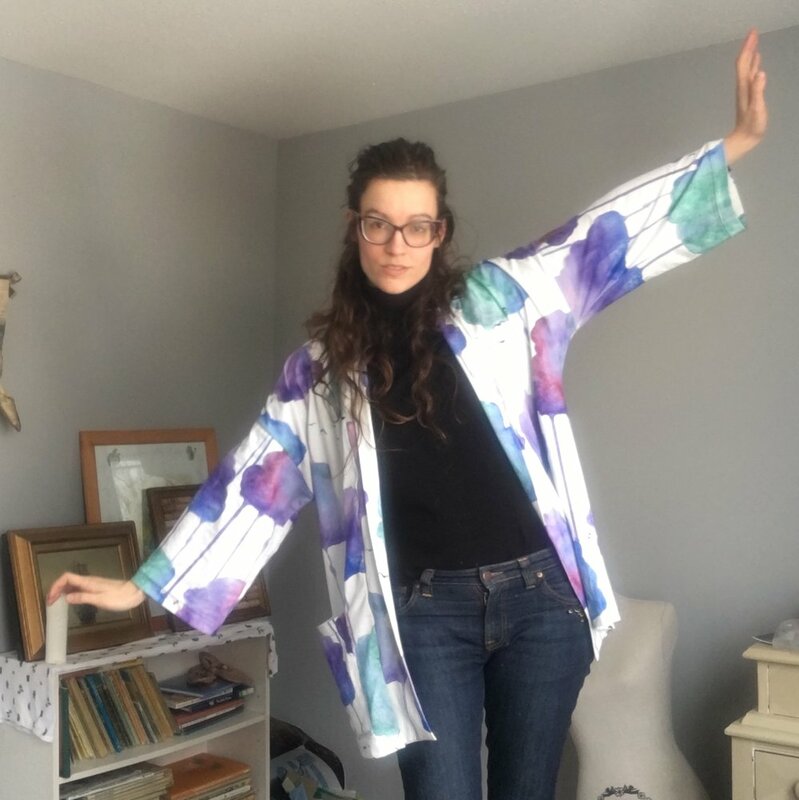 Anyway, this was a lovely project, everything I've envisioned since I bought this fabric (OK, i actually was thinking knit blazer initially, but this is in the ballpark)... and it is even MORE wearable than I thought. Thanks Kristiann for the beautiful pattern! If there is a next time: No major notes, but perhaps don't skimp on the walking foot "because it's noisy."